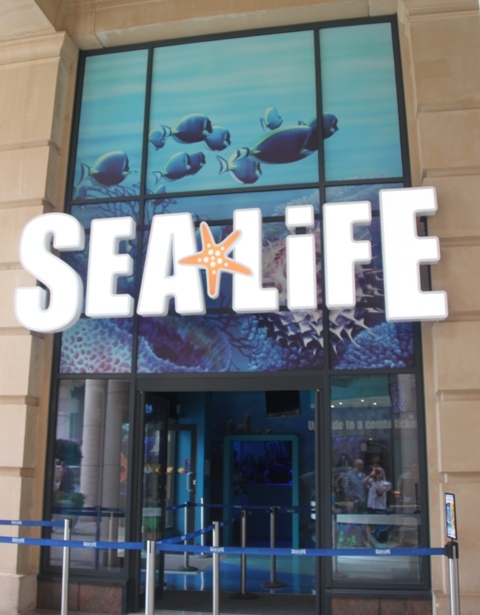 Amid much hype and publicity, the new Sea Life Manchester Centre opened in spring this year. Taken in by the effusive marketing campaign and the huge lines of people queuing expectantly outside the door on weekends, we decided to check it out for ourselves. We had two objectives – drag Son away from the cartoons he is addicted to at weekends and use our Merlin Annual Passes which were imminently due to expire (this place is run by the Merlin Group). One of the big benefits of Son’s school is they seem to have slightly different school holidays to everywhere else, so you can visit a place like this and smugly avoid the mass crowds. This we did. I had not anticipated though, the sheer number of nursery school trips – the place was swarming with infants running around freely (how they keep track of these little people on trips, I will never understand). 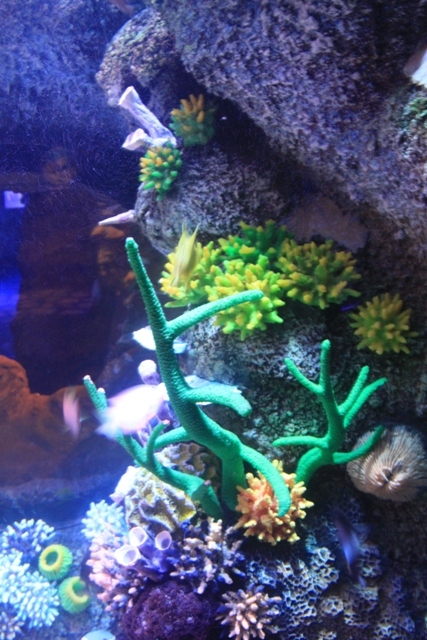 Sea Life is in Barton Square, part of the Trafford Centre retail development. 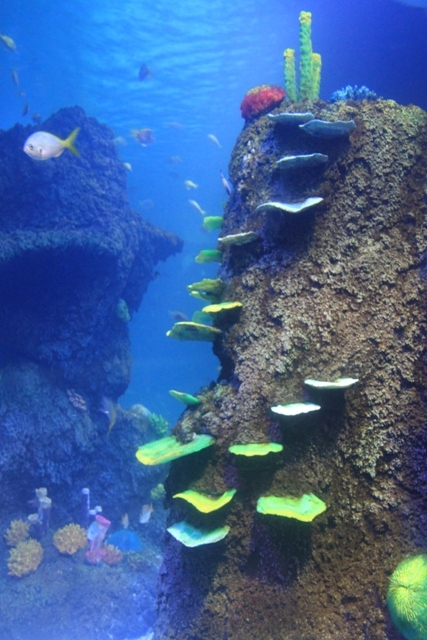 They have 5,000 sea creatures, 30 marine displays, an underwater sea tunnel, one million litres of water and so the publicity blurb goes on…. We enjoyed the first section – Turtle Beach. Having visited a turtle rehabilitation centre on the Florida Keys, this was not quite that, but it was fun and well done. It is a 3Dish show about sea turtles and how they return to the beach where they were born to lay eggs. With a globe, lights, 3D images and “turtles” on the ground it was informative and engaging. Inside the centre proper, they have lots of nooks and crannies and beautiful backlit enclosures. 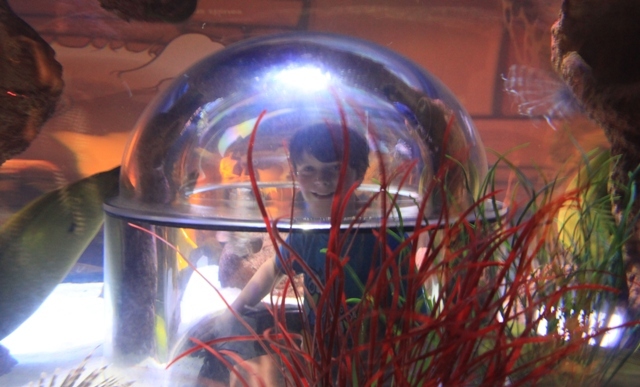 Son stuck his head into a spherical viewing station and came eye to eye with an eel. Walking through the glass tunnel, we spotted sharks and Ernie the (huge) sea turtle feasting on brussel sprouts. He was rescued from the Cayman Islands and I could have watched him glide above our heads all day. Son was not quite so enthused and dashed ahead. After some hands-on turtle activities we came to the much anticipated interactive touch pools. Here they had….. one crab. They need to rename this area, look pool would be more appropriate – it was a case of look but don’t touch. Son was not impressed. We kept anticipating something really impressive was around the next corner. All the displays were building up to this, so imagine the sense of anti-climax when, after 20 minutes of slow browsing we had reached the dreaded gift shop and exit. They are constrained here by the building – it was a furniture shop in a former life and is only 2 floors tall. 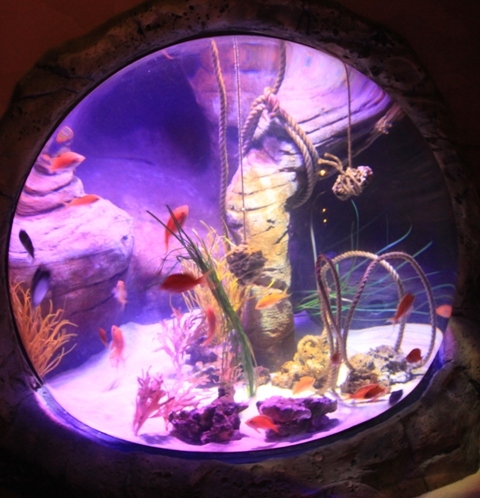 At most other aquariums we have visited, there is either a huge tank several floors high or more interactive opportunities or just something special to see. There are some lovely displays here, but it lacks the X Factor. I was relieved we had been able to use our Merlin passes. If we had paid the entrance fee proper (£16.00 per person) I would have definitely felt short changed. Ha. A look pool. Yeah, the crab is not a good choice there. Sounds like a good place overall, though!